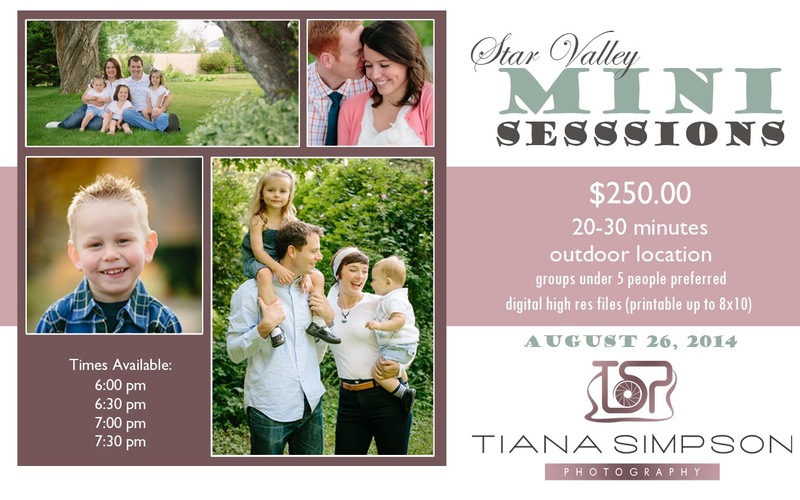 Tiana Simpson Photography is offering my first ever mini family/portrait sessions on Tuesday, August 26th. get to take advantage of this opportunity. A: A really great discounted deal! The session is shorter than my normal portrait sessions - it will be about 20 minutes long. We will take as many great pictures as possible in that time frame and give you some really great quality images! You will get the high res digital files that you can print up to 8x10/8x12. Q: Can I do a newborn session during the mini session? A: Sorry, no newborn sessions for the mini sessions. In order to get really quality newborn pictures, time is really valuable and babies don't like to be rushed. Q: My family has more than 5 people can I still do a mini session? Q: I don't have children, can I still do a mini session? A: Absolutely! You don't have to have a family to want great pictures. If you are young, old, single, married, married with kids, single with kids, it is all good! Everyone deserves great pictures of themselves. I would love to capture a few memories for you. Contact me! A: Exact location is still to be determined. It will be an outdoor location and will be in either Thayne or Afton (or in between). Sound like a great deal? It is! So contact me! Let me know what time slot you prefer (see flyer above). Be sure to include your phone number/email so I can contact you. I will send you back with a link to an invoice for you to pay online. No refunds once payment is made.